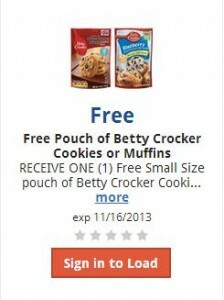 Click here to visit the Kroger site and you should be able to spot the coupon above good for a free pouch of Betty Crocker cookies, muffins, or brownies. Click it and either register a new account or signin for it to be loaded onto your card. You can only load it to your card until 3am (Eastern Time)/ Midnight (Pacific Time)/ 2am (Central Time), but the actual coupon is good until 11/16.